So, when we last left off we were at the starting line! 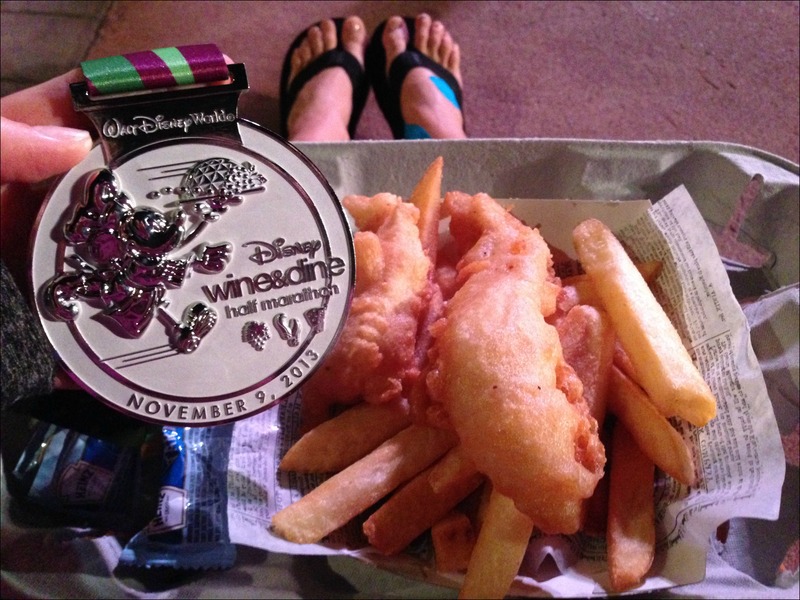 I have to admit I sort of look at the Wine & Dine Half Marathon as a good “excuse” to go to Disney and eat my way around the Epcot Food & Wine Festival with my friends (and I just happen to throw a half marathon in there for good measure!). I don’t usually love night races (who runs at 10pm?!? ), so my plan was really just to run at a comfortable pace and stop for pictures if the lines weren’t too long. Well get ready for A LOT of pictures because I was lucky enough to not encounter any lines for the characters and ended up stopping for just about every one! 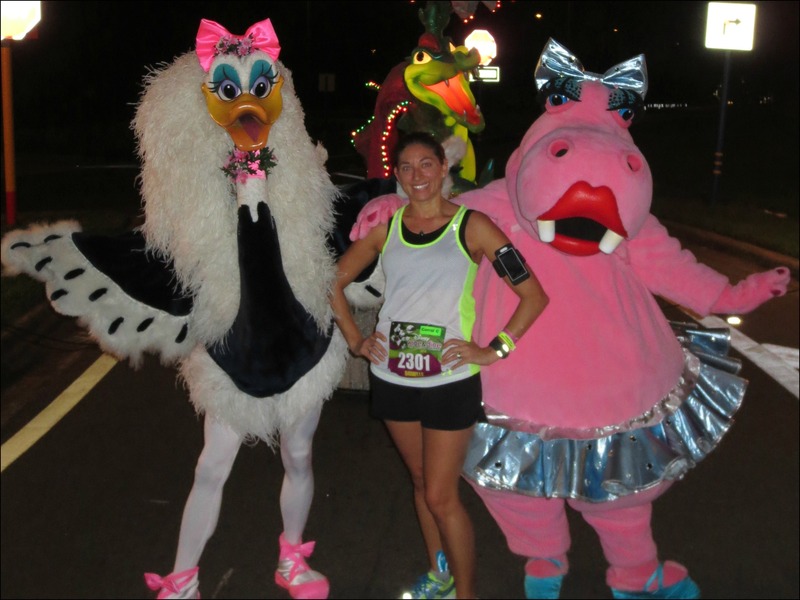 runDisney used a new corral breakdown for this event. The corrals were much smaller and at least for me that translated to a wide open course the entire way – I didn’t encounter any of the usual crowding at the start (which to be honest I usually sort of count on to keep me from going out too fast!). As soon as we started running what had been a comfortable temperature at the start was immediately uncomfortable hot and humid. I try to run races by feel only glancing at my Garmin occasionally to get an idea of what my pace is and I noticed early on I was moving along at about a 9:30 pace, definitely faster than I had been planning, especially since I tend to pick up speed as the race goes on, so I tried to hold myself back. The first character stop was the Country Bears which I passed by even though there was no line, at this point I figured I wanted to save the time for characters I really wanted. Next up I found these lovely ladies! 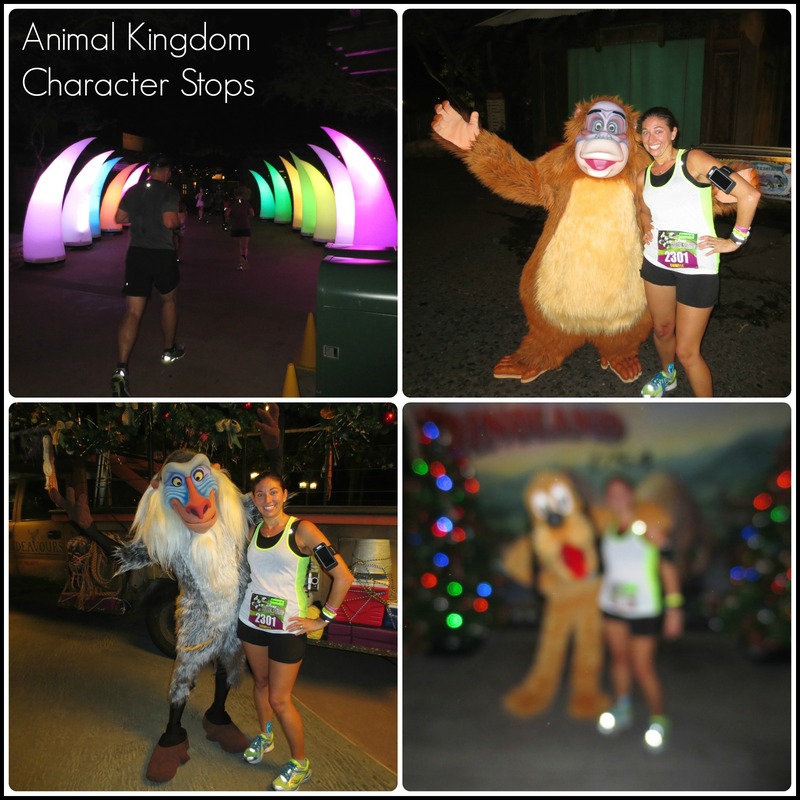 Shortly after the 5k mark we entered Animal Kingdom where I stopped for pictures with King Louie from The Jungle Book, Rafiki from The Lion King and Pluto (so disappointed this one didn’t come out! And I hear Timon was out too but he must have been taking a break when I ran by!). 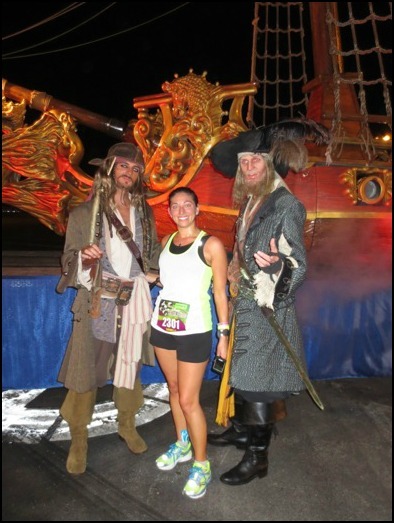 Coming out of Animal Kingdom I ran right into Captain Jack Sparrow and Barbossa! I was excited to finally get this picture since the lines are usually really long! At this point I realized that despite me trying to hold back my pace was still around 9:30. I figured instead of worrying about it I’d just go for it – if I burned out then I burned out and I’d learn a good race lesson. 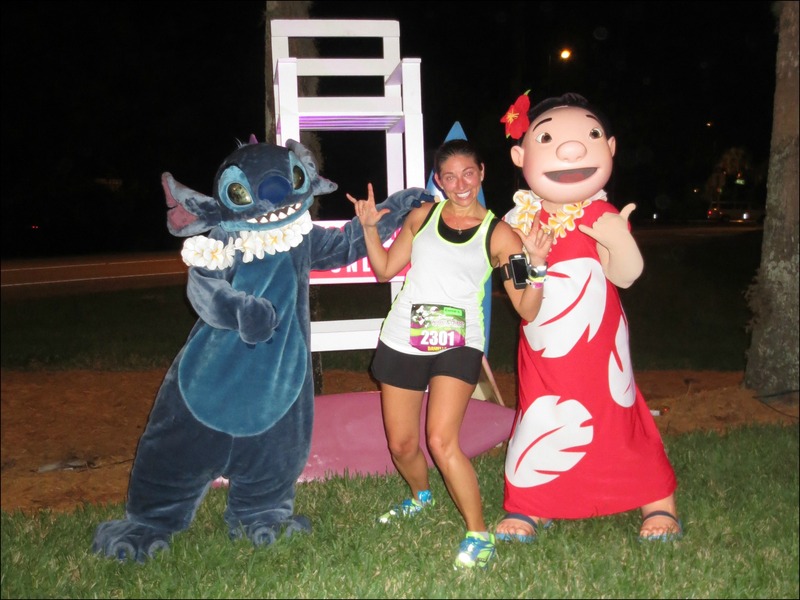 I ran up a hill to Lilo & Stitch where we had a little dance party before snapping this pic! Lilo did “hang ten”, apparently I went with sign language for “I love you” instead. Clearly too tired! I think it was around this time that I found Nicole! I’ve read Nicole’s blog for the past few months (she ran MCM this year too!) and we’ve never actually met, but I recognized her right away since she had posted a picture of her costume on her blog a few days earlier! 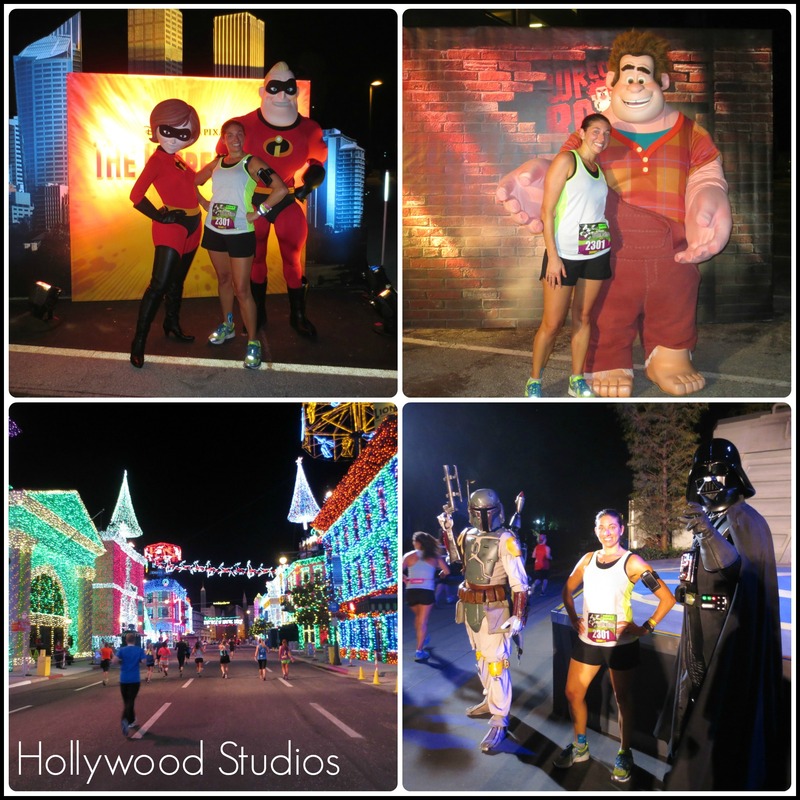 We chatted for awhile which was a nice distraction, but I peeled off when I saw the Toy Story green army men – if you’ve read any of my other runDisney race recaps you probably know I LOVE the green army men and have made it a tradition my last few races to get a picture of me doing pushups mid-race next to them. I ran over, handed my camera to someone standing near him and dropped down for my pushups, I was pretty psyched when the green army guy got down and started doing them with me, this picture was going to be EPIC! Oh, you’re wondering where the picture is? Yeah, the person I handed my camera to pressed a button to take the picture…the POWER button…and turned my camera OFF instead of taking a picture. I’m still not over it. A short while later we entered Hollywood Studios where I ran into these guys! See how I’m holding something in my hand? That’s my buddy Al and if you followed me through the weekend on Instagram you’re probably pretty familiar with him by now, but more on him later! Next up some more Pixar friends and my favorite part of the race, The Osborne Family Spectacle of Dancing Lights! The Osborne lights are just AMAZING and running through them is one of my favorite parts of any Disney race (a close second to running down Main Street in the Magic Kingdom!). I also grabbed a quick Darth Vader pic, I’ve never waited before since the lines for him are usually so long! Coming out of Hollywood Studios we were in the home stretch running along the water, past the Yacht & Beach Clubs and through Epcot to the finish line! I crossed the finish line in 2:06:02, a 9:37 pace – my 3rd fastest half marathon! Now let’s just break this down a second…13.1 miles, 12 photo stops, 5 pushups, unpleasant heat & humidity and only 7 minutes off my PR time? Hmmm…I may be in need of a PR attempt soon! 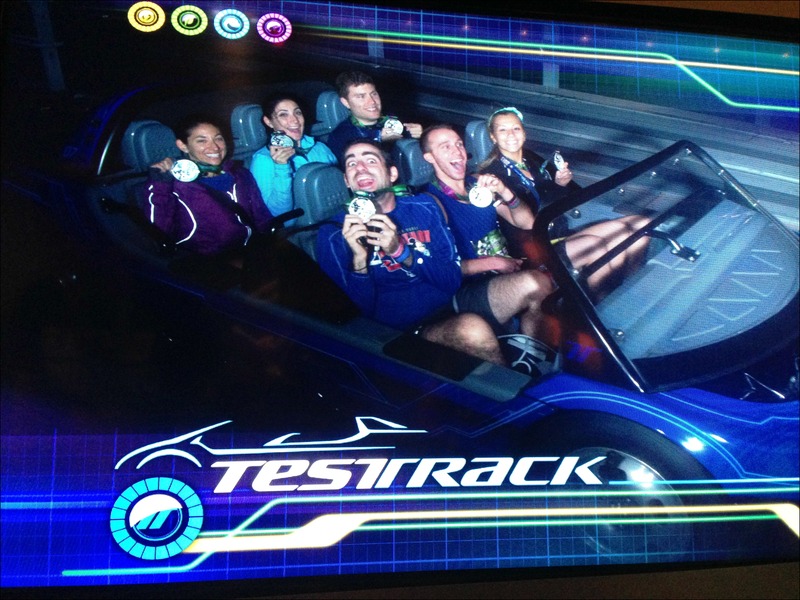 After I got my medal, gathered my bag and all my post-race goodies I made my way into Epcot and eventually met up with a bunch of friends where we rode Test Track and took this awesome high speed medal picture! And once I was feeling hungry (I can’t eat right after I run) I stopped in the United Kingdom for my favorite Fish & Chips! We managed to make it to 4am and were thankful we only had a short walk back to the Beach Club before we could crash. While we waited for Daniel to shower (he had a 4:30am Magical Express! Yes, you read that right.) Jenn and I spent some times with our legs up the wall trying to recover from the long night! By 5am Daniel was on the Magical Express and Jenn, Pat and I were passed out taking a short 5 hour nap before we were up and at it again the next day! And now on to Dopey Training! Your character photos from the race are fantastic. 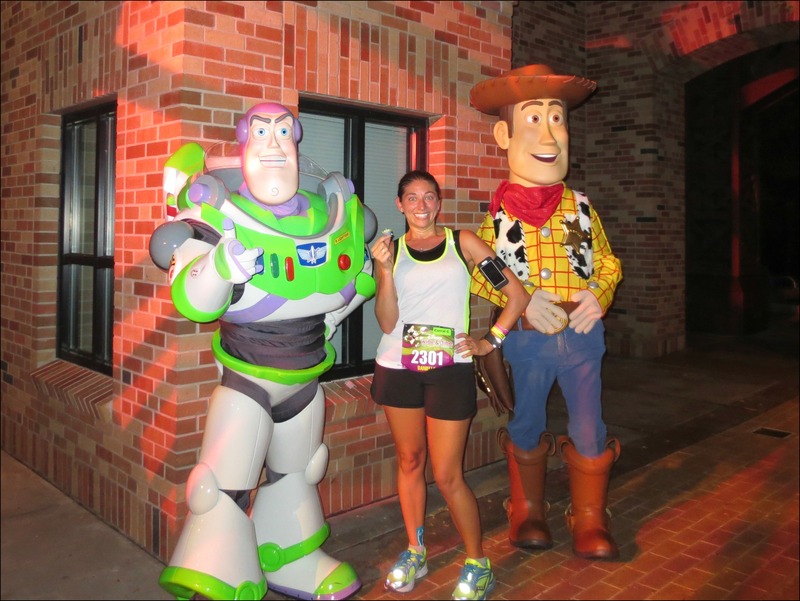 We stopped for every character during the 5k but skipped every one during the half that night. As for that time….wow…you really need to run a fast half. I bet you will have a great new PR! Thanks Pam! And yes, I am really looking forward to my next half that I actually “race”! 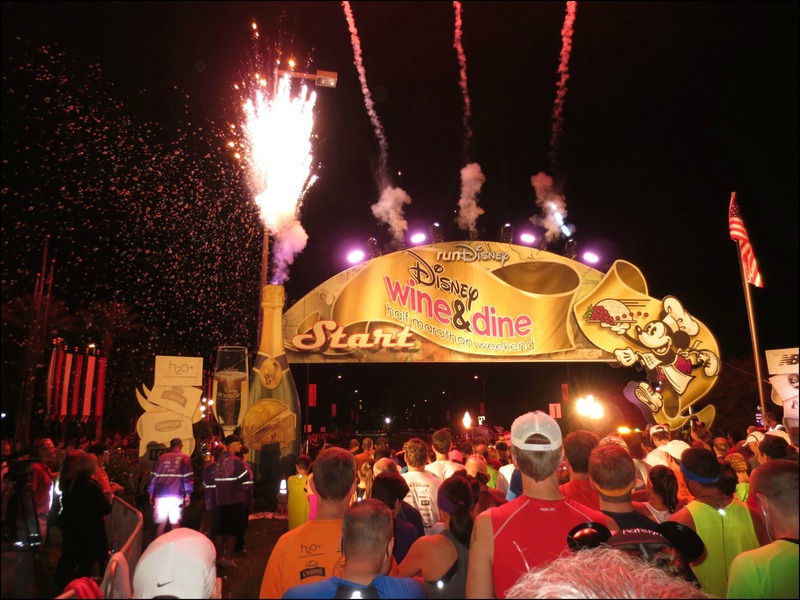 About halfway through Wine & Dine I was almost regretting stopping for all the pictures and not just trying for a PR when I realized what my time was, but I love the pictures I got! I can’t eat right after a race either. I did the race retreat one year but couldn’t eat much of the food. This year I’ll stick with the food box and hit up the Boardwalk Bakery on my way back to the room. 4:30 DME?? Who does that! OMG! I wouldn’t be over the missed photo either! Im so so sorry. I’m devastated for you.. . but no lines for characters? This slow runner is so jealous!! I put my feet up against the wall on the last day we spent in Disney and just discovered how amazing that is! Wish I would’ve done it sooner. Congrats on your awesome race time! Thanks, and yes, laying with your legs up the wall is AMAZING and such a great way to recover quickly! After doing the inaugural I have been afraid to go back. Reading about the race now gets me excited to try again. That’s kinda of how I feel about Tower of Terror – the first was was traumatic and I still have no real desire to do it again so far! You are super speedy girl! We stopped for several photos too but our time was pretty bad lol! Glad I got to see you at the meet up! Haha, trust me, I was just as surprised as anyone with that speed! 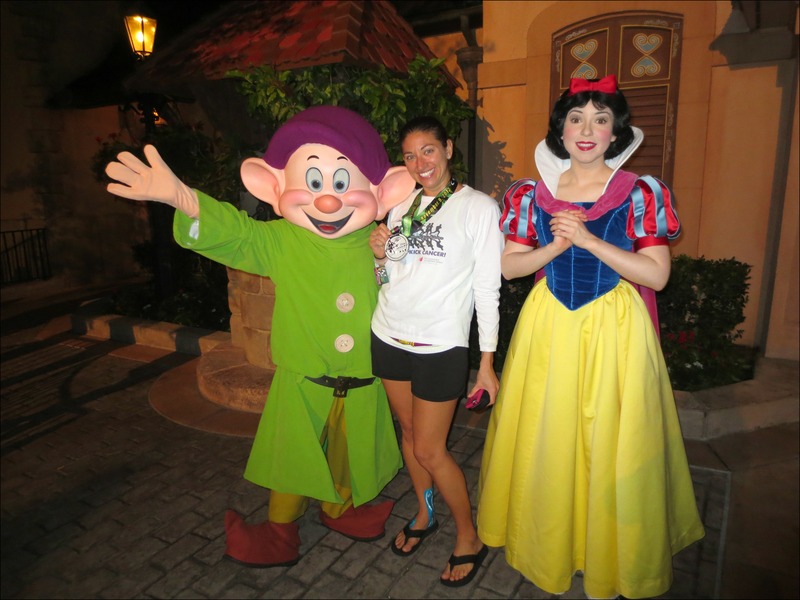 Looking forward to going for a PR at my next non-Disney half though! That is a SICK finish time, especially since you stopped for so many pictures…they look great! Go girl! I was thrilled by the no/short wait times for characters, too! Also, I have had more than a few instances of camera mishaps…it’s SO frustrating, especially if you’ve waited in line and/or it was a special photo, like your army men. Not cool! Awww, I’d probably be a little bitter if that was my race experience too. It’s too bad your friends didn’t enjoy it more, although good for you for staying with them…there’s a good chance I would have been like I’m stopping for pictures, see you guys! yay, you rocked it (except I already knew that)!! Hey, why sit with your legs going up the wall? I’ve seen that before but am curious what the benefits are! Here’s a good article that explains the benefits, but basically it drains fluid that has accumulated in your legs from being on your feet for so long and gently stretches the muscles along the back of your legs which aids in recovery! And it feels AMAZING after a long run or just a long day on your feet!